Starting off with a lovely visit to Cassidy’s town Miagen in July! Her town had gone through a lot of development since my last visit, from room updates to dream neighbors achieved to new pathing and gardening. Cassidy’s going for a dream team of blue neighbors in Miagen, and since house exteriors tend to reflect their owners, there are lots of blue house styles as well in Miagen, matching the serene atmosphere of the town’s landscaping with its many blue flowers and winding streams. She’s even working on re-decorating her dream neighbors’ houses with blue furniture, which can be a very daunting process, so major props to her for that! The bush-lined paths looked really nice too! I bet they’re blue hydrangeas, which must look striking with the rest of the town when they bloom. And this freezer room for the cafe was an especially cool idea and execution, I thought! Besides walking around exploring and admiring Miagen, we also had a really nice chat about a variety of things from pokemon to ideas for fantasy medieval-style taverns 🙂 Thanks so much for having me over, Cassidy, I really enjoyed the visit! And these vibrant pansies coordinate really well with the house exterior of Ai’s house! 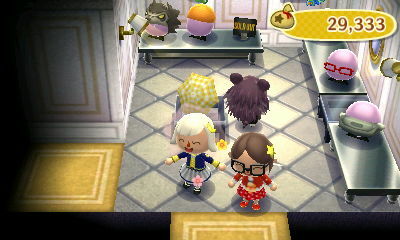 These were my favorite rooms in the two houses; I loove that doll display(?) item, and there’s such a cool mix of items in both rooms! I made a new friend on Tumblr recently, and normally I’d give a link, but it’s a personal blog and not an AC tumblr or anything. But she’s really nice and even gave me my favorite pokemon, Clefairy, in Pokemon X the other day :3 And a few weeks ago I visited her town, Okelani! Some pretty spots around town in Okelani 🙂 It’s gone through lots of construction since this visit, so it’s even better now, and you can check it out at the dream address 5300-4608-7132. Hehe, what it says when you pay off a PWP in another town. The three of us went to the island to swim and such, and do tours 🙂 There was a little game-title mention in Kapp’n’s song! Since our WiFi got cut short by errors the previous time, Choco and I had another WiFi not too long ago, this time starting in my town since she had a petition to fill up. Setting off sparklers, always a fun WiFi pastime :3 Thanks for bringing those! 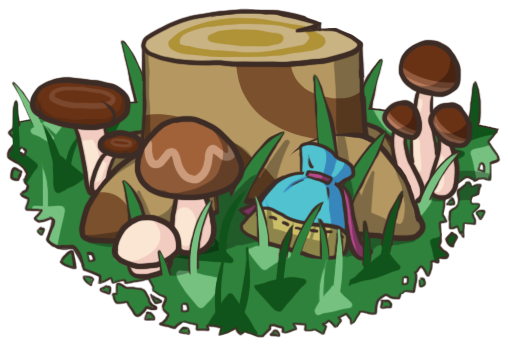 Choco got a sneak peak of some changes and additions to my town, but overall it was quite messy and under construction, so we left to go to her town after she got a look around and got her petition done. Upon arriving in Delltune I immediately started to explore and came across this beaaautiful spot ❤ I have no words, just beautiful! Stopping by the riverside well spot, which I’d also admired the last time I visited. Some cool paving around Re-Tail! I thought I could detect Choco’s influence on the neighbors’ dialogue 😛 Hahah I ❤ you Choco. What a sweet way to honor your first jacob’s ladder! I wish I thought of it, who knows what my first jacob’s ladder is now..ah well. Well that about wraps it up 🙂 For a lot of these WiFis I had to say that I couldn’t host in my town, so I thought I’d mention that my town is no longer under construction and I can have visitors again for now! But the construction was for the cherry blossom festival, which I can’t keep my town on forever, so I’ll need to make more adjustments at some point. 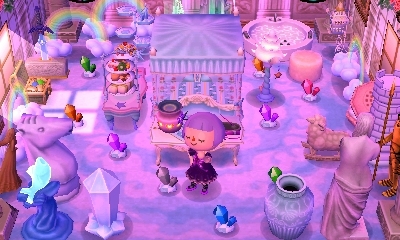 If a WiFi doesn’t work out, you’re also free to visit my dream address (4800-2245-2005), which I just updated recently ^_^ Thanks for reading, hope you all have a great week! Posted on September 6, 2014 by Amy •	This entry was posted in AC:NL, AC:NL WiFi and tagged Animal Crossing. Bookmark the permalink. Thanks! 🙂 Hehe it probably wasn’t, since I pretty much only do planned-beforehand WiFis and my last planned one (besides trades) was the one with Choco in this post. However, it might not be a bad idea to start opening my gates randomly more! The only thing is I have lots of people on my list from trades. Oh, I see… Yeah, that makes sense about having to plan WiFis if you trade a lot. Yeah it gives me a tad bit of nervousness if I open my gates not knowing who out of my 98 friends (half of which I don’t know too well because they’re from trades) will stop by xD Planning/arranging ahead of time just works better for me I guess, but maybe I’ll change my tune ^_^ And maybe I could do with a bit of a clean-out of my friends list. Yaayyy, thank you so much, I’m really glad to hear you liked it! 😀 Once I got all my dream neighbors I was able to change a lot of the PWP arrangements. Glad you liked Fern’s house too, it’s a quite different feel from all my other homes! Glad you liked seeing them! 🙂 Oh cool, look forward to seeing your underwater room ^^ I’ve seen many mermaid and fish-themed rooms and such before, but I’ve never seen a room that looked like such a mysterious underwater mermaid temple type thing before, and with that cool blue lighting too. LOL i laughed at your reactions with my villager's catchphrases.. I couldn't think of anything, really. DOOT DOOT!